Meet Your Neighbor Jerry Spiker who lives in town in Stronghurst and is head custodian/maintenance at West Central Middle School. Jerry has been employed by the school system since 1972. His grandfather, Dale Kemp, was also employed for the Stronghurst school system for 23 years. 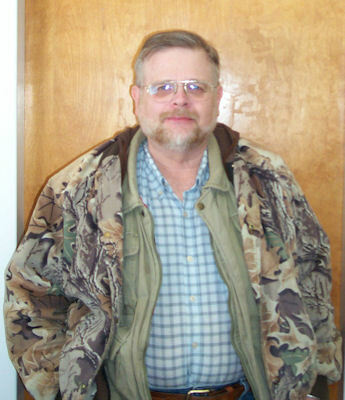 Jerry was born in La Harpe and raised in the Stronghurst area. In 1969 he graduated from Stronghurst High School and continued his education at Southeastern Community College in Burlington, Iowa, and Keokuk, Iowa. He has an Illinois Class 3 License for wastewater treatment. Victor, his father has passed away and his mother, Elsie Carhoff, resides in Stronghurst. He and his bride, Debbie, have been married for 27 years. Debbie is also employed at the West Central Elementary School as a janitor. The couple have three sons, Mike Spiker, in Tennessee, Jeremy Spiker of Des Moines, Iowa, and Dustin Spiker of Stronghurst; two daughters LoRena (Ryan) Ochsner Allen who lives in Houghton, Iowa, and April Ochsner (Tim) Phillips who lives in Burlington, Iowa. They are blessed with five grandchildren, Carl Shalynn, Treyvin, Katie, Colby and Camden. Jerry has one twin brother, Jim Spiker of Stronghurst and one sister, Janet Sherman of Stronghurst. Besides his full time employment at West Central, Jerry has a handyman business which he said, "Keeps me very busy!" He enjoys deer and turkey hunting and he and Debbie enjoy taking the grandchildren to Ryan's in Burlington, Iowa, to eat out. It's good to have Jerry and others who take such good care of our schools.